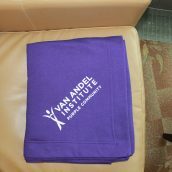 Purple Community is Van Andel Institute's grassroots community awareness and fundraising program that connects individuals, schools, teams, and businesses to the resources needed to join the fight against cancer and neurodegenerative diseases. Individualized tools and customized assistance are available to create events and programs that help raise funds for biomedical research at Van Andel Institute. When you fundraise through Purple Community, your efforts go farther. Thanks to a generous endowment established by our founders Jay and Betty Van Andel, every dollar of every donation goes directly to the cause - that's 100% HOPE!